A reticle is a clear circular glass insert inscribed with a scale that allows the observer to make an accurate measurement of the specimen being viewed. The lens that holds the reticle must have a reticle retainer ring and the reticle must be of the proper diameter for the particular eyepiece lens. For stereo or binocular microscopes, only one of the lenses will have a reticle. Any reticle scale must be calibrated, using a device called a stage micrometer. A stage micrometer is simply a microscope slide with a scale etched on the surface. A stage micrometer is generally 1”x 3” and made of either glass, metal or plastic. By making a comparison of the marks on the stage micrometer to the marks on the reticle, a value for each mark on the reticle can be determined. 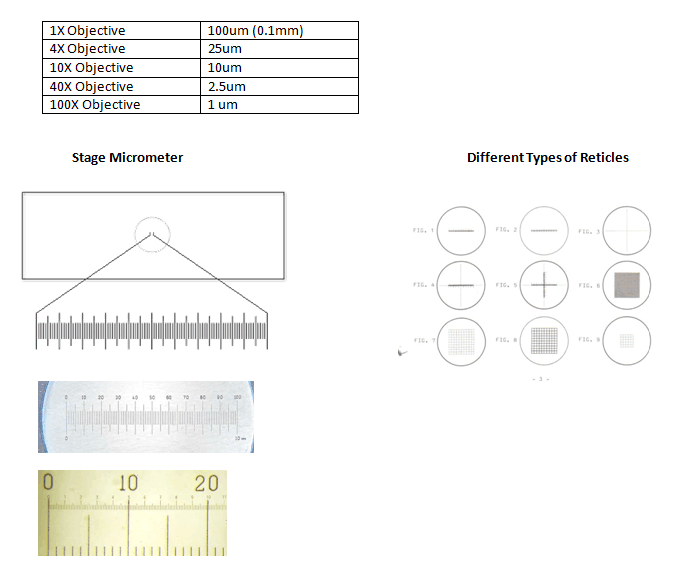 A stage micrometer is only needed to establish the relationship (ratio) between the reticle and the actual size of the specimen. When a higher power objective is used, the represented value between the marks will change proportionately. For the most accurate results, it is suggested that you calibrate your reticle using a stage micrometer for each objective lens. As an example, for a reticle that is 10mm long with 100 divisions, each division was found to represent the following distances.